A note from Congregational Development Officer, Jay Koyle about an exciting opportunity in Algoma! I invite you to join in an event being offered across the Diocese this January that will help your congregation renew its engagement with Christ crucified and risen during Lent and Easter. 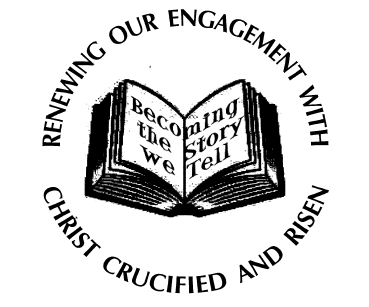 “Becoming the Story We Tell” (BST) is a process developed at the Primate’s request for the Anglican Church of Canada. It is being picked up, too, by dioceses and congregations in The Episcopal Church. Prepared for use during the seasons of Lent and Easter, it is a free resource rooted in the lectionary, the baptismal covenant, and our authorized liturgical rites. It is designed to be adapted easily in your congregation. BST includes material for engaging in reflection and prayer centred on Scripture, enhancing worship, increasing capacity and confidence in sharing our faith, and learning how to better extend hospitality to inquirers and those new to the Christian way. It is designed so that you can simply use its core components – small group Bible study and reflection (section A), supported by preaching material and resources for the enrichment of our liturgy (sections C and D, and online resources that will be posted in January and throughout Lent and Easter) – or experience it in a more expansive way through holding a pre-Lent parish event, inviting members of the parish to make an intentional journey of baptismal renewal, or preparing candidates for baptism and confirmation. Our gatherings in January will provide a one-day, deep-dive introduction to using this material effectively in your church. Through presentations, worship, trying out the resources, and conversation, you will get a taste of the BST process, learning from and with one another. You will leave with the scope and detail of a transformative 14-week Lent-Triduum-Easter experience of liturgy and small group gatherings. You will have a resource you can use during Lent and Easter over the next three years and beyond. You will save yourself hours of preparation later! Congregations that have engaged in this process elsewhere in Canada and in the United States report that it has fueled their courage for living passionately as witnesses to Christ, and for inviting others to learn the way of Christ with them. A gathering time for coffee and conversation will take place a half hour prior to the start time in each location. Please call the site you will be attending three days prior to the event to let us know the number coming from your church so we can make appropriate lunch arrangements. The Rev. Canon Dr. John Hill, the leader of the team of us who created this resource, will be present to co-lead some of these events. If you have any questions, please feel free to contact me at 705.256.5061, ext.22, or congdevelopment@dioceseofalgoma.com. Discipleship formation was identified as a prominent need and aspiration in both our diocesan assessment process and feedback received at this year’s Synod. BST is a resource ideally suited to respond to that need. I am convinced that as we engage more deeply in the journey of turning again to the way of Jesus, we will be better able to understand what it is like to turn to Christ for the first time. We will recover our confidence in inviting others to “Come and see!” We will be better equipped to walk with others as they learn the way of Jesus and become his disciples.